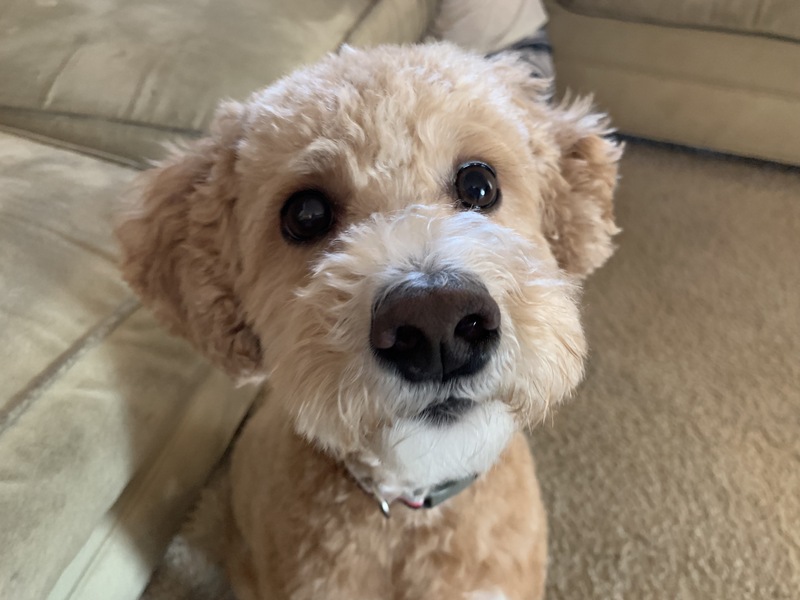 For this Omaha dog training session we taught 3 year-old Mini Goldendoodle Lulu to calm down and wait for permission to exit her kennel to develop some self control and build up respect for the dog’s owner. After chatting with the family about the dog behavior problems, I knew we needed to flip the leader follower dynamic between the family’s mother and Lulu. Lulu had bitten her a few times and didn’t show much respect for her as an authority figure. After discussing increased exercise, petting with a purpose and passive training I shared a number of new rules for the family to implement. Seeing people enforcing rules consistently is a great way to develop a healthy leader follower dynamic. The more the dog sees the human enforcing rules, the more it will see them as an authority figure. I think some of the dog behavior problems were related to not seeing the mother as an authority figure, but there may be a resource guarding issue too. This video links to a video that explains the approach I use to help dogs with a resource guarding problem. I started to show the family a leadership exercise I created years ago but I could tell it wasn’t the right exercise for this excited dog. Instead I showed the family how they could let the dog out of the kennel calmly. This was a great pivot. The kennel negatived Lulu’s athletic ability and its an activity that everyone in the family can repeat often. This will be the most impactful for the family’s mother so she should be the primary person to let the dog out of the kennel for the next few weeks. Teaching a dog to sit and be calm before letting it out of the kennel is a wonderful way to help it self restraint develop self control and practice self restraint. Id also like to see the mother walking the dog daily and we finished the session with her hand feeding the dog. This is a simple but powerful way for a human to help a dog see and respect them as an authority figure. This should help stop the dog from nipping family members. The more the family pets with a purpose, rewards desired behaviors via passive training, increase daily exercise and enforce rules, the most Lulu will identify as a follower. Changing to a follower’s mindset will be an important part of the canine rehabilitation process. And anyone can do this without studing to become a professional mini Goldendoodle dog trainer. I think this is primarily a case of a dog who has become confused about its level of authority among its humans due to a lack of rules and structure, but its possible the dog also has a case of resource guarding. This video link covers my preferred approach to stopping resource guarding in dogs. More than anything else, I want all the family members to be petting with a purpose and refraining from petting Lulu unless she does something to earn or pay for it. This will be the fundamental change that is needed for the dog to start to want to seek out attention via good behavior. Combined with more exercise and consistent enforcement of the rules, Lulu should stop accosting her primary guardian and treating her like she should. It will take a few weeks for this change to take place and we may need to make small adjustments while we do so which is why I gave the guardians my personal cell ph number so they can reach out when or if needed. To help the family remember all the positive dog training tips we shared in this in home dog psychology session, we shot a roadmap to success video.